Joe DiPietro’s The Last Romance is a quiet little drama about taking a chance, late in life. Its best feature is attention to the kind of small distinctions that can make a big difference in how people learn to accept and trust one another. NHTC member John Watson plays Ralph Bellini, an Italian-American widower who suddenly, in his 80s, becomes sweet on a woman he sees with her pet dog in a park he ventures into by chance. Soon he’s trying his best to chat her up, using all his resources of gentle joshing and kidding, turning on the charm. The object of his interest, Carol Reynolds, played by NHTC member Margaret Mann, is not so warm or inclined to be charmed. She’s a bit prickly, a bit distracted. But she’s not indifferent to the attention. As played by Watson, Ralph is indeed a likeable guy, the kind we would expect to have many casual friends. In fact, the only other major person in his life at this point is his sister Rose Tagliatelle, played by Janie Tamarkin, a bossy but also needy woman who never married. Ralph and Rose are the only siblings left of a large family. They’re settled in their ways and Rose can’t help wondering what’s up with her brother in taking a shine to a complete stranger. And it’s not just doubts about the value of romance so late in life that Rose shows. There’s a subtle sense of this odd couple coming from different walks of life that she is well aware of. Mann’s Carol is WASPY and more than a bit uptight—her repeated phrase “for shame!” should give you an idea. She speaks of having cared for a husband struck down by a stroke. The main connection between her and Ralph seems to be that they are survivors. They paid their dues in marriages, and they’re still here, and that means, maybe, that something good may yet come their way. For Ralph, dreams of romance seem to always come back to opera. He auditioned once at the Met, and director Trevor Williams handles effectively the operatic moments in the play, so that we get a strong impression of the youth and gifts that Ralph looks back on (with thanks to a cameo from Christian Shaboo). Mann’s Carol is a harder sell. It’s not clear exactly what she sees in Ralph, since she’s so slow to open up. But she does make it clear—and here changes in her wardrobe help to make the case—that she greatly appreciates being romanced again, after having pretty much given up on it. As such there’s a nice contrast between Carol and Rose, both still hopeful—in Rose’s case, it’s hoping that the husband who left her will return—and both trying to live without illusions. Which generally means they’re quick to spot others’ unreal hopes. The question hovering in the air, as with any romance, is whether this is going to end happily ever after or whether some kind of deal-breaker will surface. 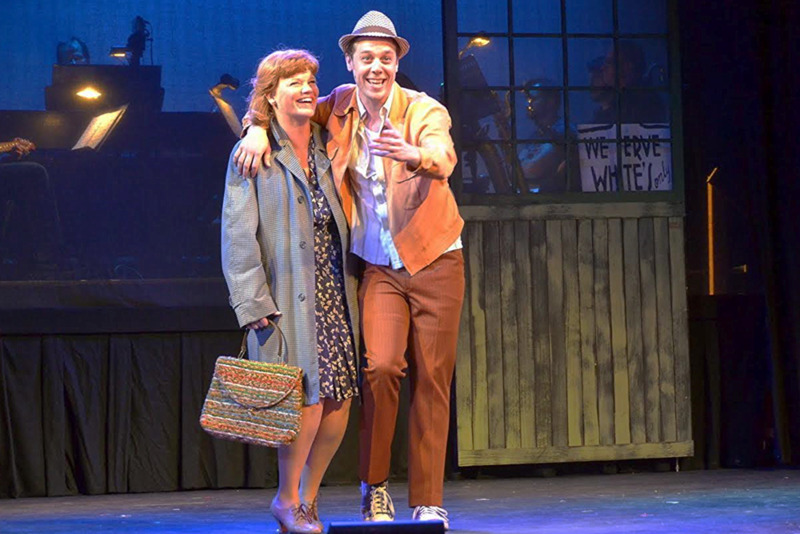 New Haven Theater Company finds in this simple and direct story a good vehicle for its actors, with Janie Tamarkin’s support adding a touch of authentic Brooklyn. In the end, DiPietro’s play seems to suggest we’re creatures of habit, but if so, it shows how some habits come from stronger ties than others. The Last Romance is a realistic romance that shows that getting what you hope for might not be for the best. Three more shows: tonight, tomorrow and Saturday. The New Haven Theater Company returns this week with their fall offering. The play chosen by the democratic company, Joe DiPietro’s The Last Romance, was proposed by NHTC member Margaret Mann, last seen in the NHTC production of Doubt. Like Doubt, The Last Romance is a play for a small ensemble, in this case three actors: Mann, as Carol Reynolds; NHTC member John Watson—last seen in the staged reading of Incident at Vichy a few weeks ago, and in last season’s celebrated run of Bus Stop before that—as Ralph Bellini; and Equity actor Janie Tamarkin as Rose Tagliatelle. As Mann well knows, it’s not easy finding good parts for actors over 60. And to find a play in which all the characters are well above middle-age is even more unique. Most theater-goers in the New Haven area seem to fit that demographic, so why not a play that, as Mann says, treats the possibility of romance between elders as “the same as between much younger people.” She describes the play as “a small play about the one thing that can change everything.” Finding someone is never easy, and DiPietro’s play shows both the luck and chance involved, as well as the obstacles. Directing the show is NHTC member Trevor Williams, also seen in Vichy and Bus Stop, who hasn’t directed for NHTC before, but who, still in his thirties, is bringing a more youthful view to the play, according to Mann. Mann directed Almost, Maine for the company in November 2013 and, like that play, Last Romance takes place in “an imagined space” that represents different settings—in this case three, though mostly the dog park. For Mann, acting is “a chance to step out of my own skin” while enjoying the pleasure of working with other actors. She admits she had “to sell” the play a bit to her colleagues in NHTC, but Watson was also intrigued with the play, and the chance to “play our age” as characters with distinct, “well-written speech patterns.” There’s “a lot of talking over” in the dialogue, and much of the play’s effect should be in its naturalness. “It’s about trying something new, when you’re stuck,” Mann says of the interactions between the characters, and the risks and rewards of getting to know new people after a lifetime amidst familiar ways. Any show with “last” in the title is apt to make us think about how much time we have left, but that question is even more relevant to those who have already lived most of their lives. Don’t miss out on last chances, and don’t miss out on New Haven Theater Company’s The Last Romance, showing for the next two weekends at the English Building Markets, November 10-12 and 17-19, at 8 p.m.
Memphis, the Tony-winning musical by Joe DiPietro, Book and Lyrics, and David Bryan, Music and Lyrics, closes its run at Ivoryton Playhouse tonight. The show, a spirited crowd-pleaser, finds at Ivoryton an intimate showcase for its story of interracial relations surrounding the rise of black R&B—known, in the white music business of the 1950s, as “race music”—into a cultural force that eventually gave birth to rock’n’roll. Key to R&B making it across the racial divide were disc jockeys like real-life Dewey Phillips who first played black music for white audiences in Memphis. Inspired by Phillips, Memphis dramatizes the struggle to desegregate the radio as a key element in the effort to desegregate our country. In that sense, it’s a show with a vivid historical sense of how popular music could be a force for change. Meanwhile the “rights” to the music—as a racial and not simply a cultural heritage—gets disputed hand-in-glove with the question of whether or not love can cross racial boundaries, with Felicia’s soulful “Colored Woman” and Delray’s electric “She’s My Sister” insisting—in the face of Huey’s often naïve indifference—that race is always a factor in the lives of African Americans. These themes come to a dramatic crest at the end of Act One when, after an act of violence shocks Huey into reality, Gator, a formerly mute bartender, steps up to sing “Say a Prayer,” a song with a strong sense of how gospel music was the basis for the heart found in R&B. But where can the show go from there? Much depends on Huey expanding beyond the "hock-a-dooing" huckster of the first act. Carson Higgins inhabits the role with the kind of natural sure-footedness that makes even Huey’s less likeable aspects fully engaging. So, as he rides to success in Memphis, Huey must also deal with Felicia’s ambitions, which stretch beyond the Jim Crow South, her eyes on New York. Huey, in other words, has to face the fact that his love—whom he would like to marry—may be a bigger sensation than he is. While this takes us into A Star is Born territory, it does make Act Two an emotional struggle for Huey, and Higgins, with director Todd L. Underwood, is able to find the heart of this shifting, self-satisfied showman. His big song in Act Two, “Memphis Lives in Me” feels heartfelt and earned because we see what the town has done for him and to him and how much it has meant to him and cost him. Along the way, there are many powerfully charged moments, in part because the show is so well-cast, with fully developed turns from Teren Carter as Delray, Melodie Wolford as Gladys, Huey’s mother, Beau Allen as Huey’s canny boss, and David Robbins as Bobby, a worker at the radio station and regular at Delray’s club who gets his moment of fame singing “Big Love” on Huey’s local TV show. These supporting parts lend the show much of its cred, and, in its key role, Renée Jackson gives Felicia a palpable hunger and sadness that help to sustain the meaning of the “blues” in R&B. Otherwise, we might think “race music” is all about having a good time. What even Huey can’t register is the degree of suffering the music acts as counter to, for its singers and makers and dancers. Jackson lets us feel what the structure of the show only suggests. For, in the end, this is still Huey’s story. He, like many a hero, goes too far and grabs for a do-or-die moment that cooler heads would steer him from, and ends up with far less than he hoped. DiPietro does well to pull back from the happy-go-lucky happy-ever-after, that Huey would wish for himself, to take a sadder but wiser look at the time’s realities. Music may inspire us and bring us together, but—when it comes to recording and commercial radio—it’s a business first and foremost. A play about loyalty, love, and deception should strike a few nerves, and when the story unfolds in what are often called “the corridors of power,” we have not just a story about how a couple weathers a storm, but about the fraught relation between public and private worlds. Joe DiPietro’s involving The Second Mrs. Wilson, directed by Gordon Edelstein at the Long Wharf, with a sumptuous set by Alexander Dodge and a stellar cast, lets us contemplate both a powerful romance and a unique historical situation. When President Woodrow Wilson (John Glover), a widower, becomes sweet on Mrs. Edith Galt (Margaret Colin), a widowed lady of his acquaintance, the tongues of his advisers begin to wag and their visages to frown. Kept onstage throughout the play as a kind of an Old Boys’ Club version of a Greek chorus, Colonel Edward House (Harry Groener), Secretary Joe Tumulty (Fred Applegate) and Dr. Cary Grayson (Stephen Baker Turner) look on and trade misgivings about the lively romance we see unfolding between Glover’s Wilson, lathe-thin and boyish, and Colin’s Mrs. Galt, an engaging matron sincerely flattered at this new flame. DiPietro’s script keeps the flirtation within the bounds of propriety while flaunting the charms of a second chance for the middle-aged. Early on, one of the best scenes features Mrs. Galt and House facing off on how a new bride could affect the president’s bid for a second term. In The Second Mrs. Wilson, dialogue is at its best when, as here, a game is afoot: who will best whom in the give and take of looking after Wilson’s interests and maintaining an interest in Wilson? That note, once sounded, becomes the key note of the second act when Wilson, struck down by a crippling stroke at the end of Act One while hawking his League of Nations legislation across the country, comes fully under his wife and his doctor’s care—much to the consternation of his advisers, his Vice President Thomas Marshall (Steve Routman) and his staunchest opponent, Senator Henry Cabot Lodge (Nick Wyman). The deception by which press and public and political interests are kept at bay seems rather astounding to our heavily surveyed times. As the weeks stretch into months, the brave front of Mrs. Wilson comes to seem as cut-off from political reality as her husband’s adamant upholding of “God’s will,” i.e., his plan for the League. And that’s where The Second Mrs. Wilson becomes a starker and braver play than might be expected from what seems at first a romantic-historical melodrama with comic overtones. The first act gives us a play about the importance of a wife for Wilson and makes us see that, despite what her detractors think, Mrs. Wilson is equal to the task of being First Lady, a strong historical point. But, once the president is incapacitated, the romantic elements move from the couple’s love to a romance with Wilson’s ideals as Mrs. Wilson struggles to keep her husband in power. For those who are not of Wilson’s party or, like his VP, are simply disliked by the president and his wife, exclusion from the inner circle becomes a study in frustration. Eventually we find ourselves looking on at the playing out of a folie à deux, one that, depending what one makes of a missive from House never opened, had considerable historical consequences. The staging of the play at Long Wharf is exemplary. The thrust stage has been decorated with handsome wings where the “chorus” take a seat in comfort. A pool table adds the feeling of male camaraderie among the background players, while the striking touch of an ornate convex mirror seems to show us history in a glass. Center stage is Colin’s Mrs. Wilson, by turns girlish, steely, clever, and never anything but loving toward her fallen hero. Glover’s Wilson is a defining role as well, played with winning brio—a labored delivery of a satirical limerick while partially paralyzed pretty much sums up the man’s character under duress. The president’s bonhomie is fully registered here, countering any sense of him as severe and stiff, and his almost fanatical pursuit of his grand ideal of the League, spurred by the horror of the Great War, becomes increasingly plaintive the more doomed. As Cabot Lodge, Wyman has a brooding tenacity and the measured cadences of an old school politician, making hay while the sun shines. Applegate is steadfast as the pragmatic Tumulty, and Turner, as Dr. Grayson, suitably torn between the recovery he hopes for and the deterioration he fears. Two other standout roles: Routman as the wary VP who wants what’s best so long as he doesn’t have to run things and who bristles like any man kept waiting too long for an audience, and Groener as House; seen as a Judas by “the saint” Wilson feels on his way to becoming, House is conflicted by his great admiration for Wilson and by his sense of the political situation they are caught in. His admonition about Mrs. Galt, that it is political novices who take personal affront at matters of policy, becomes something of a hoist on his own petard, as his personal affront to Wilson’s policy-making loses him both friend and position. Full of fine performances that unroll with well-paced precision, The Second Mrs. Wilson shows that the person closest to the one in power may also be said to be in power. A fact about First Ladies that has not been often enough acknowledged, perhaps. DiPietro and Edelstein should also be commended for not dressing the situation up in a post-feminist view of woman’s obvious equality, but hewing to the era’s sense of the personal prestige “a lady” could manipulate as, simply, not a man. Mrs. Wilson, we see, knows how to make the most of forbearance and how to turn her opponent’s skepticism into respect. Her great fault, in the end, may be her protective effort to keep her ailing husband from playing politics with the boys. Now that the International Festival of Arts & Ideas has come and gone, and even the Yale Summer Cabaret is on a hiatus until it resumes on the 11th, what is a theater person to do? One possibility is start thinking about next season. Last week at the Long Wharf Theatre, Artistic Director Gordon Edelstein and Associate Artistic Director Eric Ting, in a conversation on stage, situated in two comfy chairs, outlined the coming 50th Anniversary Season of the New Haven theater staple, giving a nearly full house details on the process behind their choices and introducing three dramatic readings from the final three plays to be featured. Ting, taking the role of interviewer, asked Edelstein “what is the process” in picking plays for a season. There was a charge of applause indicating that many in the audience wonder about that very question. While allowing that the process of selection is the “hardest thing,” Edelstein alluded to his 25 year experience of “picking seasons” both at Long Wharf and in Portland. He mentioned some of the logistics that affect decisions—most notably the “shrinking size of shows,” so that shows with huge casts are harder and harder to put on. And yet Edelstein said he always begins with what he “dreams of doing”—the shows he most would like to put on or see put on. “All our dreams are never realized,” he admitted, but he never loses sight of the main purpose: that a play “say something about what it’s like to be alive now.” And, throwing the question open to the audience a bit, he asked how many would agree that the future of the theater is in new writing and in finding works that appeal to a younger demographic. Most present seemed to agree heartily with this proposition. Alluding to “the bumpy road and false starts and detours” of a process Edelstein called “complicated” and “non-predictive,” he also spoke of the three main desiderata: that the play be relevant to our local community, that it reflect the times and the country we all live in, and that the season end with a balanced budget. He added that one of the key questions each year is what the centerpiece of the season will be. This year, for the 50th anniversary of the Long Wharf Theatre, he gave that question considerable consideration, with some ideas including works by Arthur Miller, such as The Crucible, which was the first play produced at the Long Wharf, or Death of a Salesman which has never been staged there and which Edelstein would like to direct, though, he added, he felt it was “the wrong statement” at this time. Ting, still the interviewer, set up the next play on the bill by restating a “story” he heard that author, comedian, actor, playwright Steve Martin, upon seeing Edelstein’s version of Martin’s The Underpants at Hartford Stage last year decided that he must have the director do Martin’s Picasso at the Lapin Agile. Edelstein recounted how he met Martin at a production of The Underpants and knew that Martin felt the show had been done to perfection. Next thing he knew, he heard that Martin told the producers planning a revival of Lapin Agile that, it’s hoped, may go to Broadway for the first time, that Edelstein was the man for the job. Consequently, Long Wharf audiences will find another clever Martin comedy offered up with a sense of both its verbal absurdities and its slapstick pace, as was The Underpants. And if it does get to Broadway, you can say you saw it here first. Called by the New York Times one of the best comedies of the 2013-14 season in New York, Joshua Harmon’s Bad Jews takes up the theme of legacy where two cousins, one male and one female, battle over a religious necklace, an heirloom that their late grandfather, a survivor of the Holocaust, kept concealed on his person throughout his years of captivity. The jousting between the staunchly Hebraic Daphna and her less observant cousin Liam fuels a play of the comic ties and trials of blood relations. The except on stage at the Long Wharf preview readily attested to the comic potential of Daphna’s belligerence and the hapless niceness of Liam’s non-Jewish girlfriend in the face of such superior attitudes. For the penultimate production of the season, director Eric Ting brings us a play that has its finger on the dismaying news events that continue to surface in the supposedly “post-racial” America of the Obama presidency. Kimber Lee’s brownsville song (b-side for tray) tells of the aftermath, for an interracial family, of the loss of young, engaging and promising Tray. Revealed to us in flashbacks, Tray’s life involves, in the scene enacted for us at the preview, managing a Starbucks where his step-mother, who abandoned Tray and his younger sister to their grandmother’s care, shows up, looking for a job. An “issue play on some level,” Ting said, “at heart it’s about family,” and the role it plays in dealing with tragic events and the hardships of contemporary life. The final play of the season, directed by Edelstein, will be the world premiere of The Second Mrs. Wilson, a play that revisits an interesting historical situation. President Woodrow Wilson’s first wife died while he was in office and he became the first president to woo and wed a woman while president. That would be interesting enough, perhaps, but the situation of the play is more pressing: not long after the wedding, Wilson suffered a stroke and was largely incapacitated. Di Pietro’s play looks at a situation in which a woman, persona non grata to the Cabinet and others trying to run the president’s administration, has to take charge in a man’s world in her husband’s stead as de facto head of the Executive Branch. In the scenes enacted at the preview, we saw Edith Boling Galt, a widow, charm the donnish president Wilson; in the second we watched her take command, delicately but firmly, of a meeting with one of the chiefs of staff. A play about the kinds of tests and resources in life that demand strong resolve, the play is relevant to the changing role of women in American politics. Subscriptions are already on sale. Single tickets will go on sale Monday, August 4. For more information about the 50th anniversary season, visit www.longwharf.org or call 203-787-4282.